For anyone who believes that a pool table is not just for playing a game on, but also a statement of design and a true work of art, we are proud to present the innovative and stunning Le Lambert coin operated slate bed pool table. The Le Lambert's unique design has been created by combining input from Europe's most consistent and successful professional pool players with the latest in ground-breaking high-tech and innovative construction techniques. With simple elegant lines and its unique stainless steel metallic finish, the Le Lambert will look superb in any setting, and due to its advanced construction is built to stand the test of time. The Lambert is available with a wide range of finishes, cloth colours and sizes. What's more there is also the option to add exclusive LED lighting and lamps. This table is a true future classic. The Le Lambert has a genuine stainless steel metallic finish on the cabinet and legs and a wide choice of colours for the top rail and cabinet panels. The Le Lambert can be finished with any commercial laminate, and as such, is available in a variety of wood grains, matte colours & metallic colours. Below you will find some samples - do call us to discuss any other colours or finishes. The Billard Toulet Le Lambert is fitted with a renowned Hainsworth Smart playing cloth. Made from 95% Merino wool and 5% nylon, it is designed to be extremely durable and last the test of time. When choosing your pool table it is important to consider the size of the room you wish to place it in. 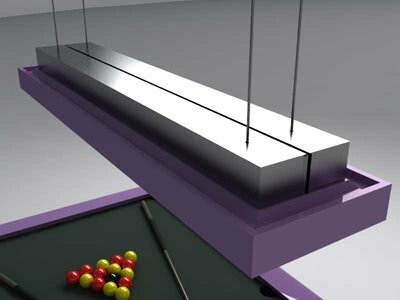 It is recommended that there is enough room to extend the pool cue from the outside edge of the table to the wall. The dimensions given below are very much an "ideal" size - you can purchase smaller cues to help with tricky shots in tight spaces. The Lambert is delivered and installed by our dedicated fitting team who have years of experience - please note that this is to a ground floor location as standard.